You'll be £4.99 closer to your next £10.00 credit when you purchase Military Badge Collecting. What's this? This book is a comprehensive guide, which will appeal to anyone with an interest in medal collecting. The book contains over 800 illustrations. An essential guide for collectors or researchers of Military Insignias. Often when researching photographic evidence regarding British military personnel one can identify a military badge. Usually for the British army these badges, especially cap badges, enable the researcher to identify the regiment to which the wearer belonged. This book, now in its seventh edition, is an invaluable guide to using these cap badges to this extent as well as presenting them as a specialised arena of collecting. Cap badges have been long used by the British army to identify regiments. Originally the army’s regiments were numbered. However, since 1881 they have often been referred to by name. Often, but not necessarily always, the regiment’s name is not on its regimental crest so this book significantly helps to marry the badge with the formation it represents. 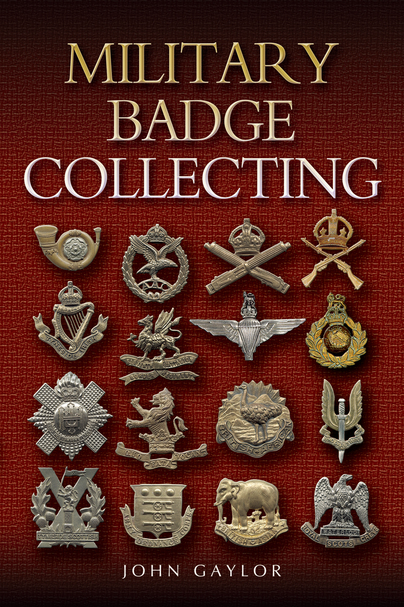 After a brief introduction to the hobby of collecting these badges the author presents information on different formations. These include (but not exclusively) the Cavalry and the Royal Armoured Corps, the Guards, Regular Infantry (pre and post 1958), Airborne Forces, Volunteer and Territorial units, Women’s Units, Kitchener’s Army, the Gurkhas and many others. There are 58 plates towards the rear of the book which present a myriad of badges. These plates significantly aid the identification of formations from their badges and they are presented in an easy to use manner. There are some exceptionally interesting and useful appendices. They cover the Order of [Regimental] Precedence (in 1971 and 1995) and the Formation of the Territorial Regiments in 1881 (this appendix links the numbered pre-1881 regiments with their “new” names in July 1881). Appendix D gives details of regimental badges produced in brass during the First World War. Before 1916 some badges were previously made in bi-metal (brass and nickel) but due to wartime economy measures their manufacturing became limited only to brass which also helped in the mass production of them. The follow on from this was in World War 2 when the 1941 Army Council Instruction announced that certain cap badges would be produced in plastic due to metal shortages (see Appendix E). Other appendices deal with the translation of mottoes, Plumes and Hackles, the badges of Volunteer Battalions and finally the Tartan backings for Scottish infantry regiments. The style of this publication lends itself to two primary functions. Firstly as a “badge identification” guide book and secondly an aid to the regimental badge collector. Although it was written with the latter in mind I consider that the primary use will be in identification of cap badges. This is an excellent text and complements the bookshelves of any researcher of the British army. The authors (Mr Gaylor died before the seventh edition was published and it was revised by two joint authors) have conducted an outstanding feat of research and I can only summarise by saying “Well done”.